Jewel Master: Cradle of Athena is a puzzle game enriched with adventure and strategy elements. The title was created by a German development studio Cerasus Media specializing in this type of productions. Jewel Master: Cradle of Athena is a game from the so called casual (occasional players) cycle of puzzles. This time, developers from Cerasus Media studio based on motifs taken from the history and mythology of ancient Greece. As in other games from the Jewel Master cycle (e.g. Jewel Master: Cradle of Rome, Jewel Master: Cradle of Persia), the player plays the role of the builder of an ancient metropolis. At the request of the goddess Athena, he must build the capital of Greek civilisation and its most famous buildings. The task is complicated by various events related to mythical heroes and beasts. The basis of the game are puzzles of the type combine three elements (match-3). The player must change the position of the blocks on the screen in such a way that at least three blocks with identical symbols are placed in one horizontal or vertical line, which leads to their removal from the board and gaining a certain amount of points. The reward for completing a task is usually raw materials and plans needed to erect new buildings or solve problems that afflict residents. In the main campaign, the creators prepared a total of 100 boards of increasing difficulty. In addition, players can unlock 15 bonus levels related to Greek myths. Alternative gameplay mode - relax mode allows you to try your hand at any puzzle of your choice. 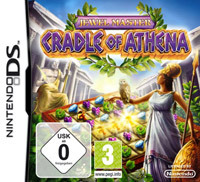 From the technical side Jewel Master: Cradle of Athena is based on solutions known from earlier releases of the cycle. Two-dimensional graphics are characterized by high color intensity and cartoon stick. The creators also took care of the possibility of controlling the Nintendo DS console touchscreen display.